Sis. 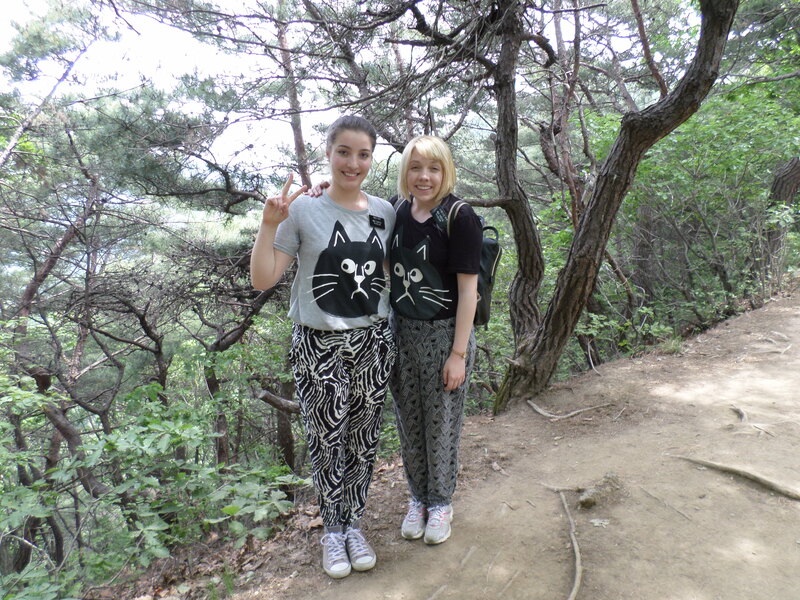 H and I decided to wear Korean outfits to the conference, so we bought cheap cat shirts and grandma pants at the market. Ha ha. Don’t judge us. 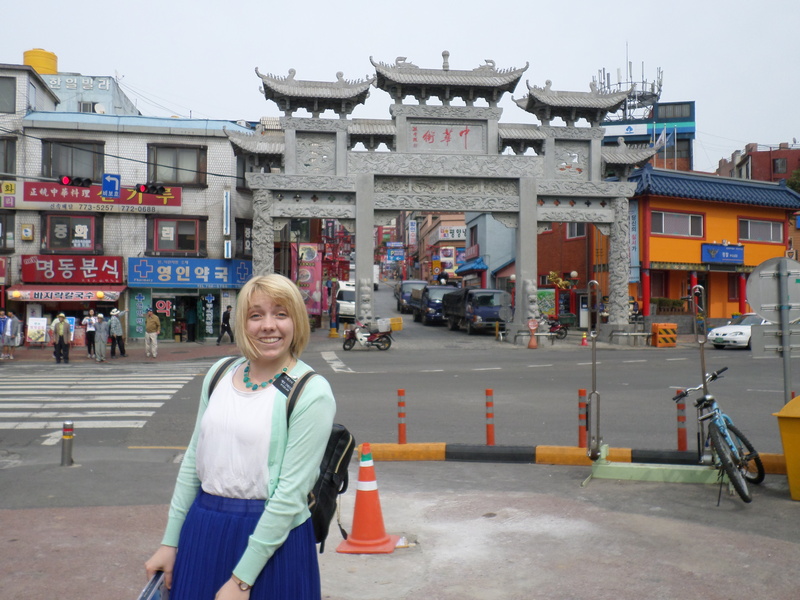 This past week we had a really sweet Zone Conference where we went hiking and had missionary training up in the mountains to Namhansanseong (or South Han Mountain Fortress). Ahh! It was so cool! I loved it a lot. It was a really fun day of hiking and having devotionals along the way. It was really great! Sorry, I did not budget my time very wisely today with emailing, but I tried to write a few tiny details with all the photos I tried to upload this week. This week we get to go to the temple and see Elder Quentin L. Cook. It’s pretty exciting! Because we are going to the temple this week, today isn’t our P-day. We only get to email, but that’s pretty cool with me! 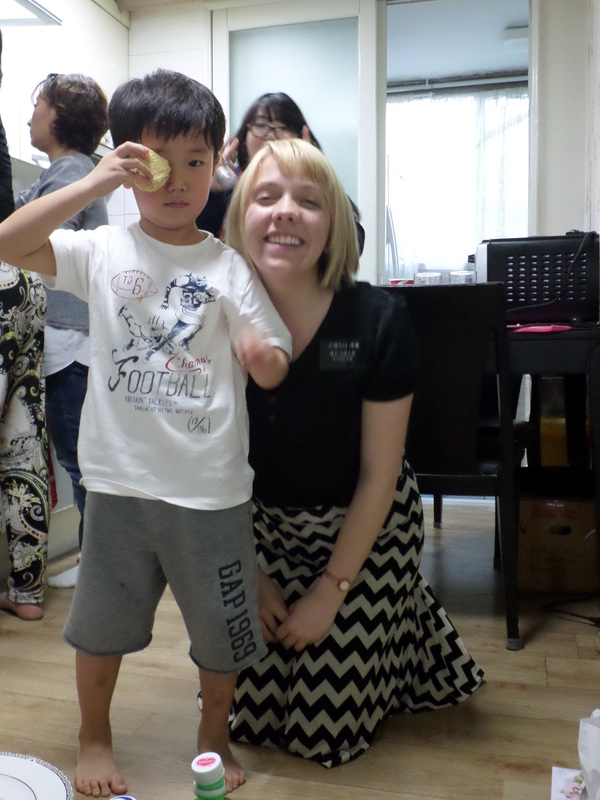 This last week we met a girl from England who is here teaching little children English and Korean, and we started teaching her! There is so many accents when Sister H. (from Australia), her (from London, England), and me (from the coolest–Boise, Idaho) are together! I love it. It’s also really nice to be able to understand everything that she says since she speaks English. She doesn’t have any religious background, but she told us that she believes there is a God because everything in the world just seems to point to it. I like her a lot. The weather is starting to get more hot and humid but it’s not too uncomfortable yet. Everyone keeps telling me horror stories about summer in Korea and I’m pretty pumped to experience them first hand haha. Love you a lot! Sorry this letter is short, I will write more next week. 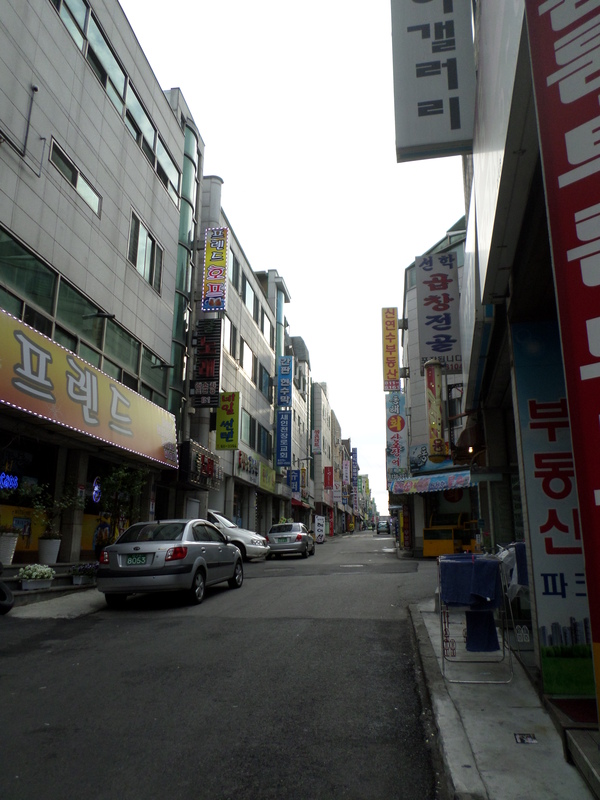 Here are some more photos from the Korean cultural center we went to for P-day and some other zone conference pics. On a bus with our entire zone on the way to zone conference in the mountains. It was so crowded, I can’t even tell you. Ha ha. Some other rad folks that also wore matching outfits to zone conference. Wooh! Hahaha, I’m not going to say that we weren’t studying, but I am going to refer you to page 20 in “Preach My Gospel” if you want to see why we took this picture. This week has been pretty hard, but Heavenly Father has been blessing us a lot through our trials. We started meeting with three new people who have Gospel interest and who also happen to be fluent in English. Two of them (a husband and wife) are hakwon teachers. A hakwon (I think that’s how you romanize it) is an after-school school. I love Korea. They’re so studious with their schooling. They just approached us on the street one day and started talking to us (in English) about how they really like our church, and we were like, “Well crickey’s” (I have an Asian-Australian accent now). We met with them a couple days later. They love learning and teaching, so we gave them the Restoration pamphlet in Korean and gave them an assignment to translate and teach it to us next time in English. Haha! I really like that assignment. They were pumped about it, too. They started translating it right then and there because they were so excited about it. Meeting them was a big blessing! Bishop gave us a giftcard to a free meal at a meat buffet! Oh my goodness! He’s so nice! It was so good! You just choose a bunch of different meats and then you cook it at this charcoal grill right there at your table and just dip it in a bunch of different sauces and things. Mmmmmm! It was awesome! Meat is pretty expensive in Korea so we usually don’t buy that much of it as missionaries. 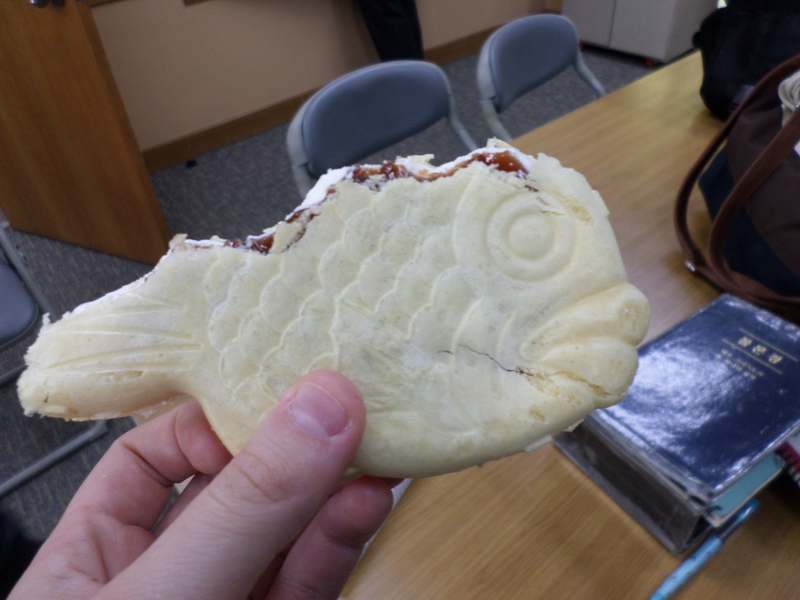 This is an ice cream sandwich with red beans inside of it in the shape of a fish. I took a picture of it because it started looking really pretty scary after a couple bites–haha! It’s really good though. I would have never thought red beans would make such a delicious dessert item, but they’re awesome! This is really the Lord’s work, and I know that even in the really hard times, Heavenly Father is there. Hope you have a good week! I LOVED SKYPING YOU for Mother’s Day! The skype machine is so brilliant! Ahhh I loved it! Sorry if I rambled a lot. I was so excited to talk to you that I didn’t really think of what I should say–haha. I’m so grateful that I have such a wonderful family though! This week we were reading in Alma 44 where one of Moroni’s soldiers does a nice object lesson with the scalp of Zerahemnah, and Sister H and I thought that was really effective, so we decided to do some object lessons of our own with everyone we taught. But instead of cutting off scalps, we decided to make cookies. It went great! I think what made it really meaningful is we thought of a different analogy for every person. With a few lovely less-active members, we ate cookies and talked about how each ingredient is a commandment, and how all the ingredients combined make a delicious treat that brings us happiness (Eternal Life), so it’s important to keep all the commandments. With one of our investigators we made cookies with her, her friend, and family and talked about how some ingredients by themselves don’t taste good, and seem to have no meaning (like flour, or baking soda, or raw eggs), and how this is often like trials in our lives–they don’t taste good and they seem to have no meaning. Why do we have them? But in the long run, all the things we go through in our lives do have a purpose and are very important. Just as a cookie needs to go through heat before it is completed, so do we need to “go through the heat” and hard times before we can be perfected. We had a couple more analogies for different people, but I think you get the point. Everyone seemed to really like the analogies and get a lot out of them. We were really happy. Even though missionary work is really hard at times, this week taught me that you can have fun and still be a good missionary. Deep. We know. We eat a lot rice. Hope you have a fantastic week! This week the weather has been a little bipolar. One hour it’s sunny and nice and then the next hour it’s raining! I thought there was a lot of rain coming down, but people have told me that it’s nothing compared to Monsoon season. Someone tried to explain monsoon season by acting as if they were pouring a jug of water out…yah can’t wait . Haha, no, but I am actually pretty excited for the rainy season. It looks gorgeous when it rains. Yesterday, we had a miracle while fasting where we were walking around the street and we saw our English class coordinator who wasn’t at church yesterday. Since he’s had times where he has been less-active we were worried about him, so we started asking him inspired questions and learned that he is struggling with his faith, so we shared our testimonies with him how God does love him and is willing to help him through hard times. It’s amazing how you can see people change right in front of your eyes when they are touched by the Spirit. The Lord helped and comforted him a lot. I love that the Lord guides us to those in need when we ask and actively seek for the opportunities. 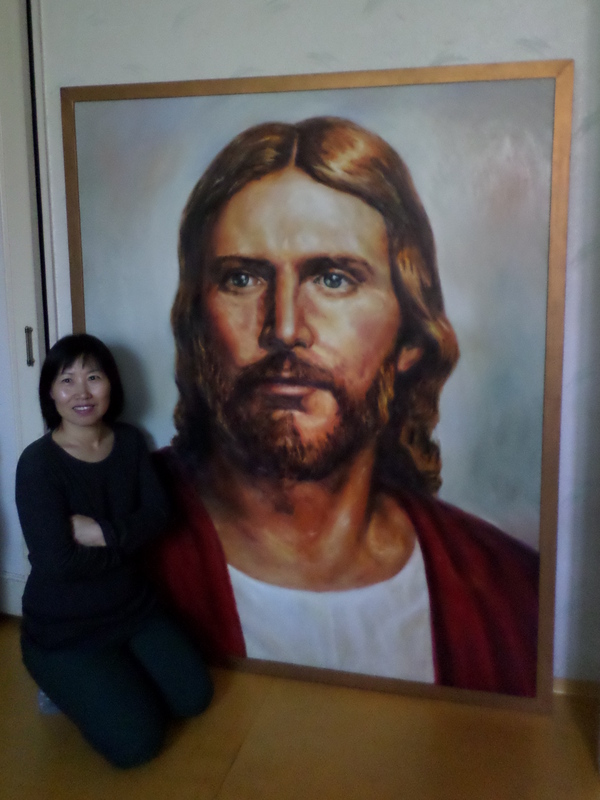 Here’s a picture of a member who made a huge painting of this picture of Christ! It looked amazing in person. Even better than the original. She’s so talented. So I learned recently why Koreans make the two finger peace sign in every picture. There’s a couple of different reasons. The main one is that it actually is a “V” for Victory. It’s like expressing that everything is going awesome! Victory! 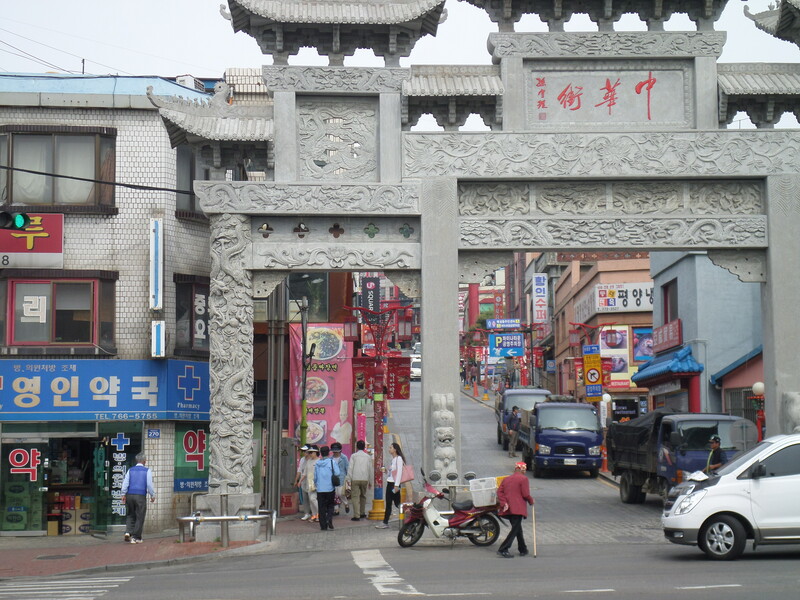 It references Korea’s past history and how they are now flourishing economically as a country. The Elders in their typical poses. Just kidding. We love them. Another reason is that it’s prettier to have a “V” shaped face (I’m not sure why, but that’s what Koreans think) so lots of the girls like doing peace signs next to their face because it helps with that appearance. The third reason people do it is because it’s just what people do. Koreans are really proud of their culture, and peace signs are a part of that. Whenever I took pictures with the Koreans in the MTC, they would ask if we could “do something Korean,” and then they would flash peace signs, so it’s kind of become a habit for me. Koreans like it, but I’m going to try to not do it in every picture. I promise! Fun mission fact: We go out tracting and talking to people a lot. We actually have to keep track of how many people we talk to in a day (whether it’s about the Gospel or not). By the end of the week we usually try to aim for 100 people that we had conversations with. Anyway, have a spectacular week. Love you!